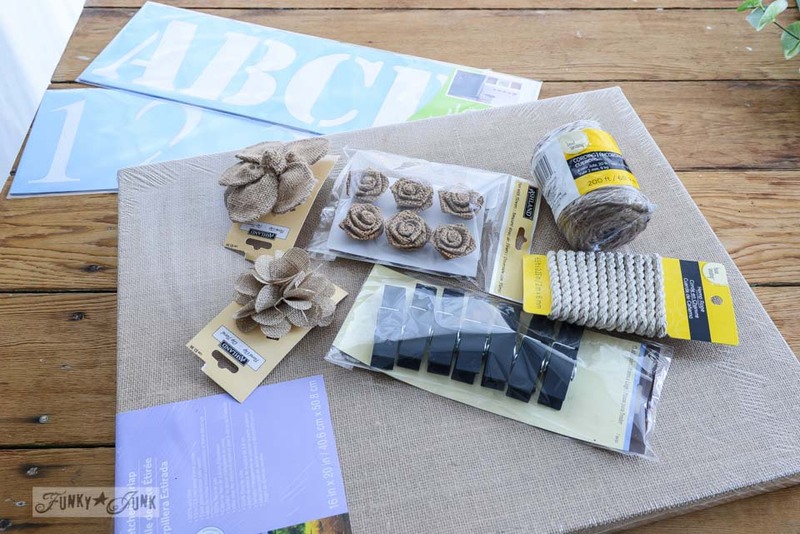 I’m loving all the new elements with old tyme style, such as the coffee bean bag feel bulletin board, aged antique jars, the little rustic crate, and so much more. But the very BEST part on all this is how versatile and productive everything is. Topiary tutorial and where I used the chalkboard pennant kit is HERE. 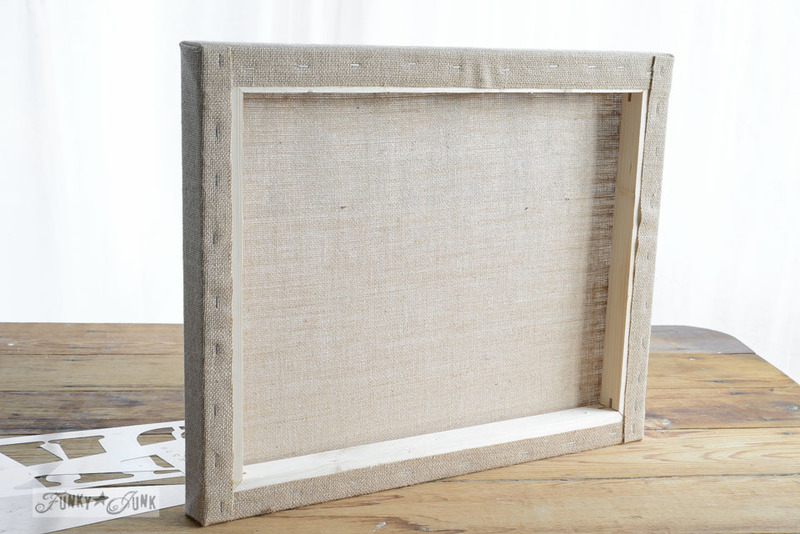 Michaels carries these stretched burlap boards in all different sizes. This made my job so easy! The frame is nice and beefy which would be perfect for what I had in mind. 1. 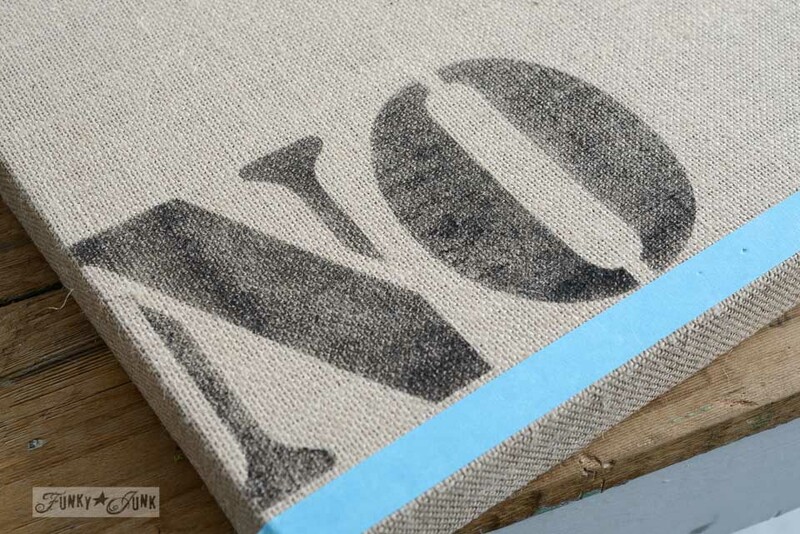 Run some tape along the bottom of the board to create a line to align the stencil text. 2. 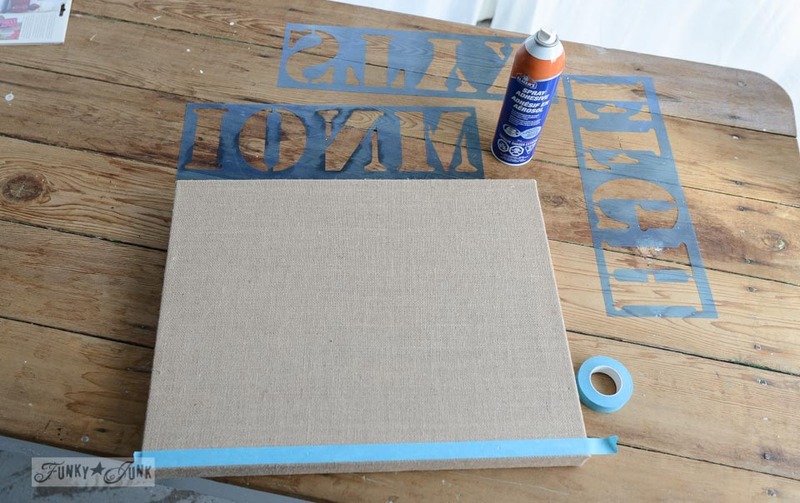 Lightly mist the back of the stencils with spray adhesive… let sit for a few minutes to allow some of the tack to dissipate. 3. 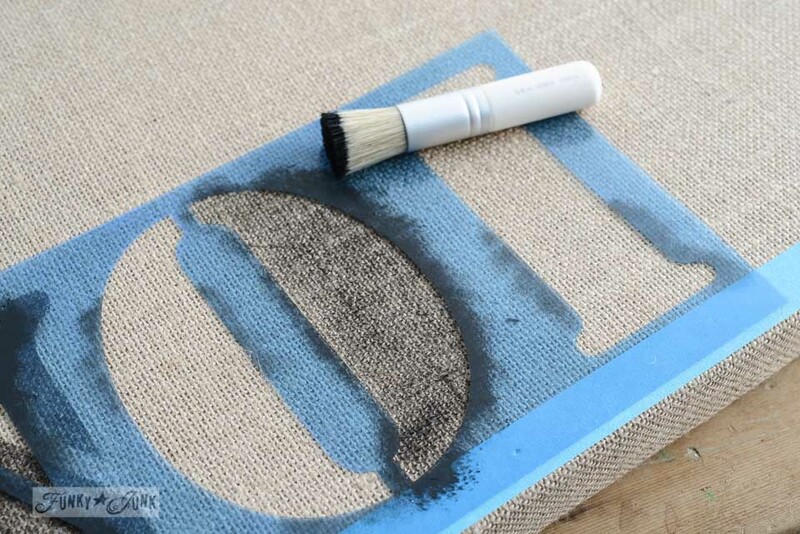 With black acrylic craft paint and a stencil brush, pounce the stencil. Because the frame was hollow inside, I slipped a chunk of styrofoam underneath to create a surface. Tip: remember that rounded letters will dip lower than straight lined letters, so I started the N higher than the O would eventually sit. 4. 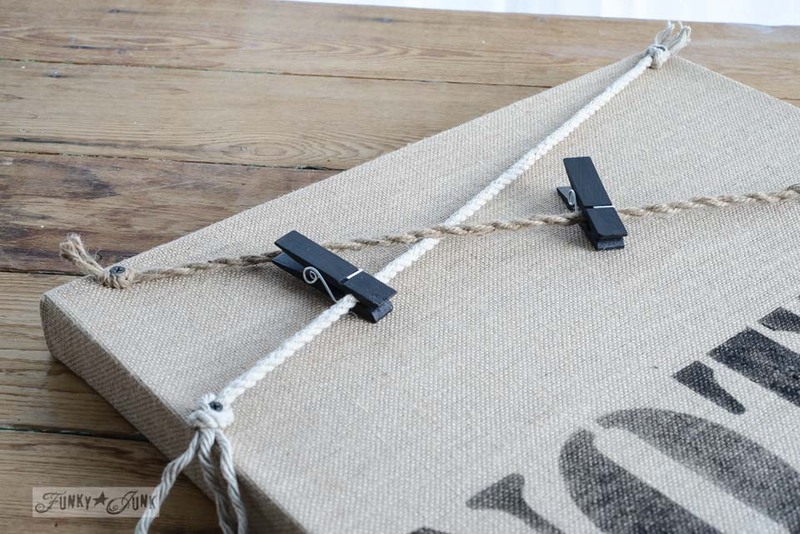 Using different twine, the ends were knotted, positioned as desired, then screwed to the frame through the knots. I left the ‘tassel’ on the left long because I felt it was rather funky! 5. Chalkboard clothespins were clipped into place. 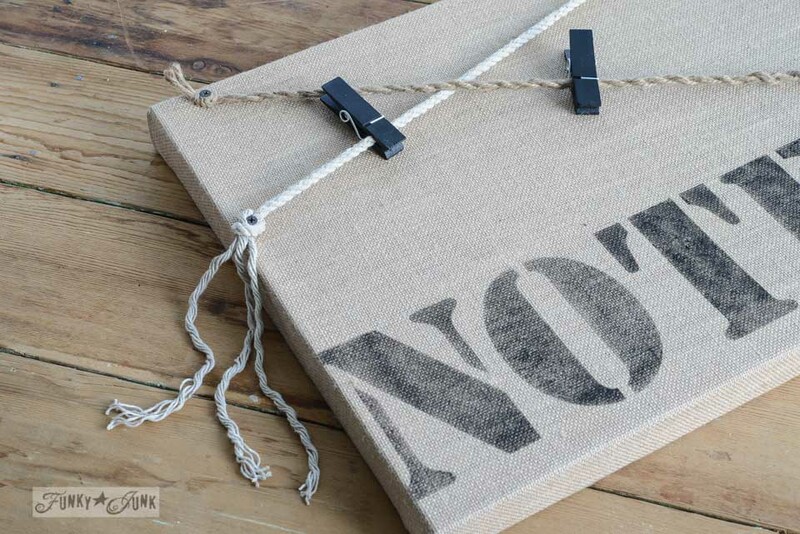 These are fabulous if you wish to label notes! 6. 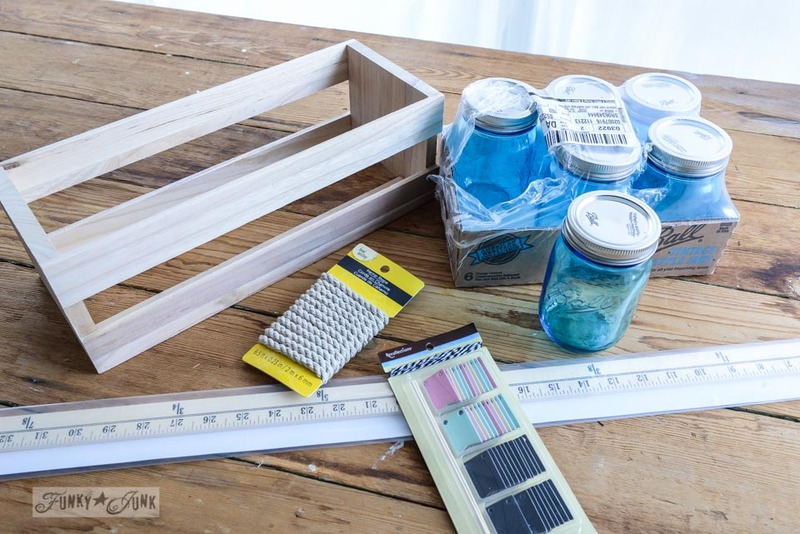 Grab a cute little crate from Michaels, and wash it with VERY watered down brown craft paint for a stain of sorts. This enhances the wood tone. 7. 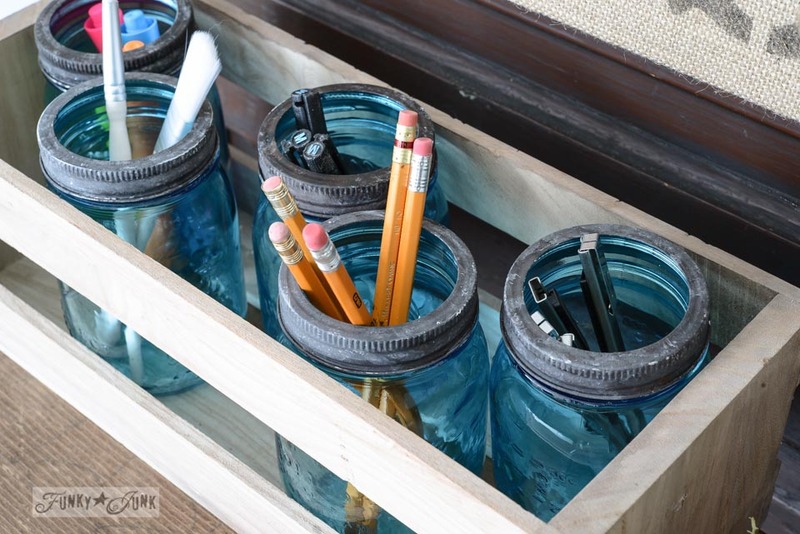 Fill the cute crate with blue mason jars, then fill them with writing materials. How to age new mason jar lids is HERE. 8. 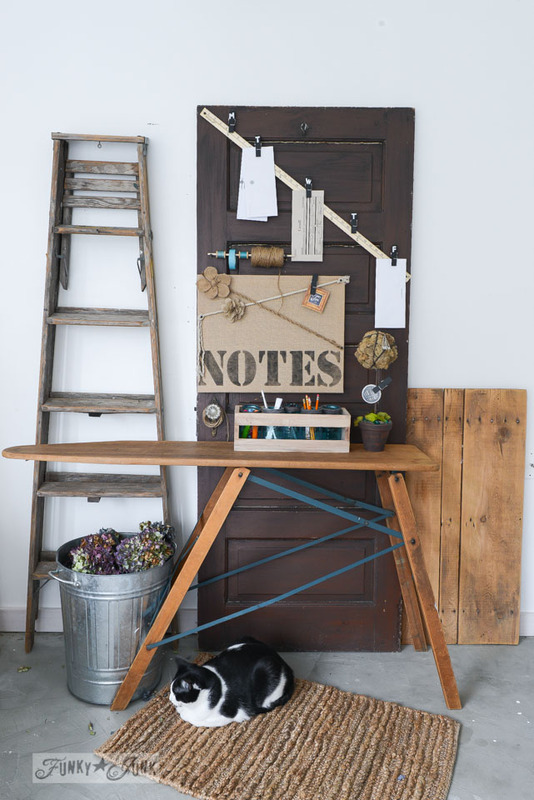 If you’re fortunate enough to have an old door as a back drop, it is so perfect to mount all kinds of useful things! 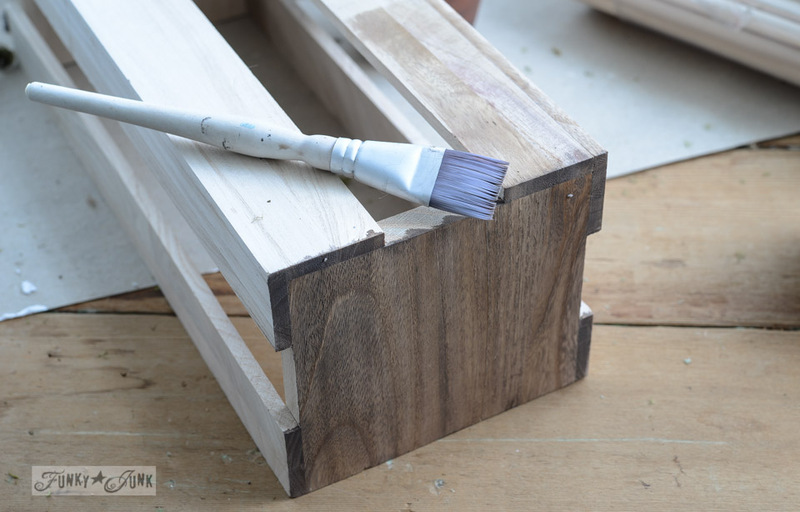 Two screws hold up a small dowel, feeding tape, thread and twine into place. If you’re anything like me, you’re always looking for a needle and thread, a quick piece of tape, or some twine. No more! 9. Screw a yardstick into place on an angle. 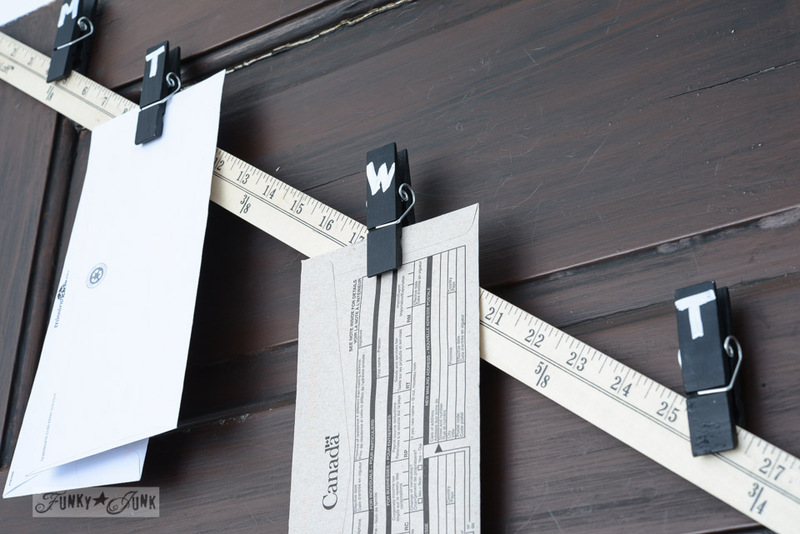 Clip on your daily clothespins, then hang up the bills / notes / paperwork. No reason to forget anything now. 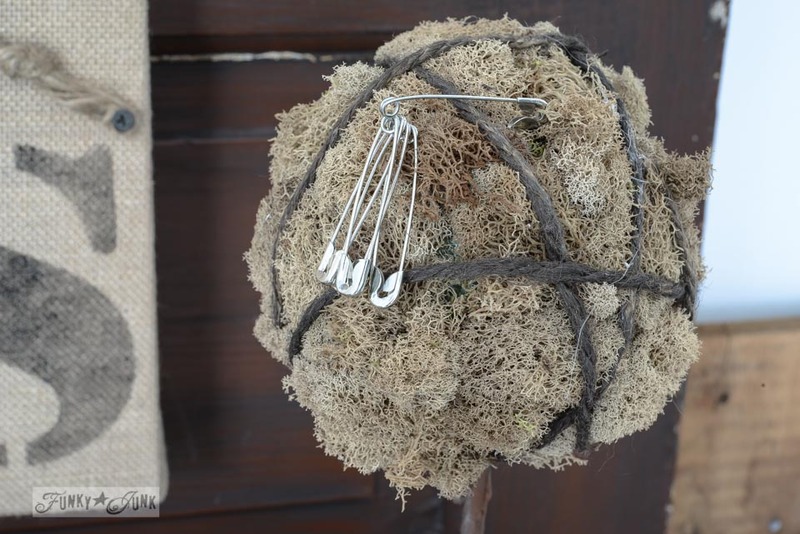 Use a cute moss topiary for a pin cushion! How to make this one will be shown on Wednesday. 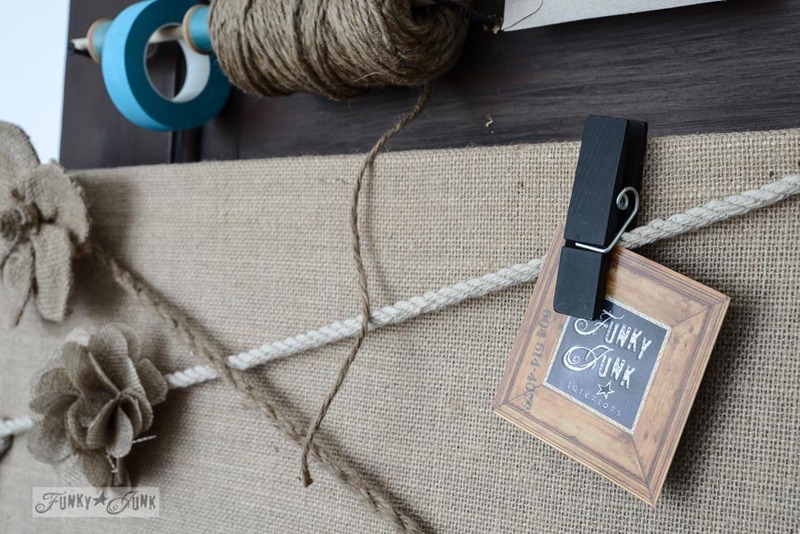 The burlap board mason jar yard stick message centre is perfectly cute and organized! I created it in my photo studio so I could bring it with me to my Sunday show. Kitty will have to stay home though. Hopefully it gave you some ideas on how you can enhance your own! 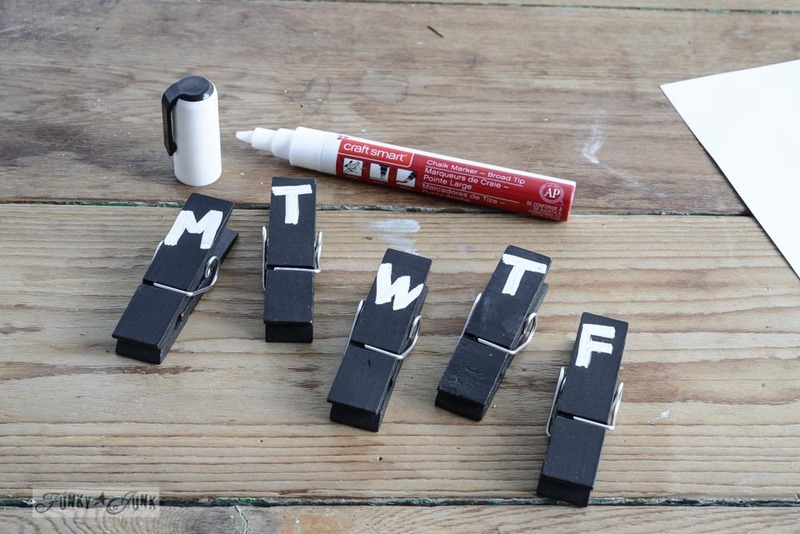 More projects tomorrow… cya then! 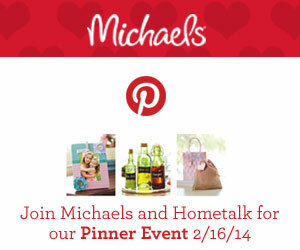 Click below to visit all my craft projects. This is so fabulous!!! I absolutely LOVE it Donna!! Love this, Donna! I think that command centers are the most useful things ever – and yours is so lovely! Those blue mason jars are some of my favourites, too. You are so creative girl! 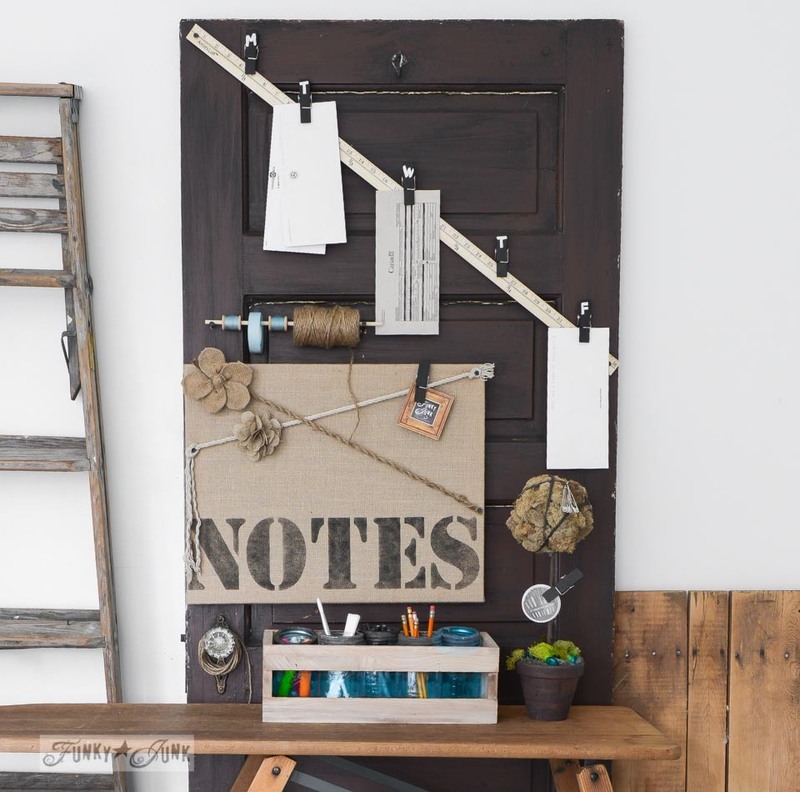 What a great use of an old door. 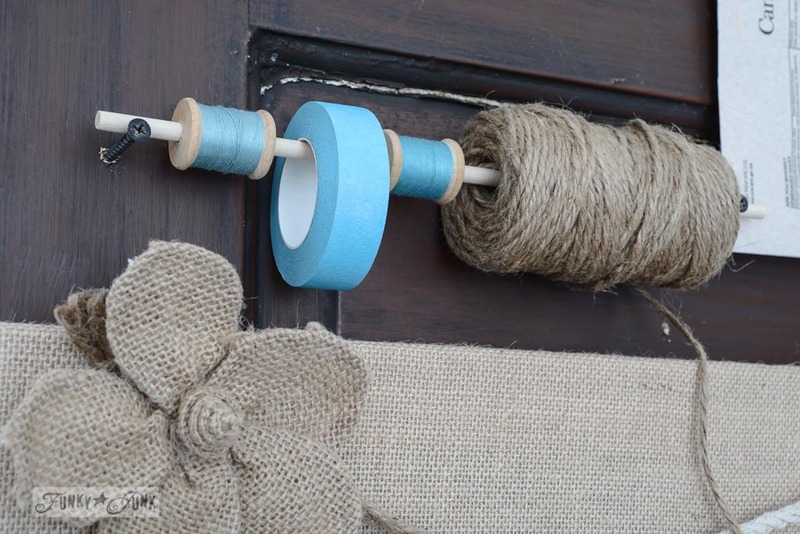 All of the items you attached have purpose and beauty… perfect combo! 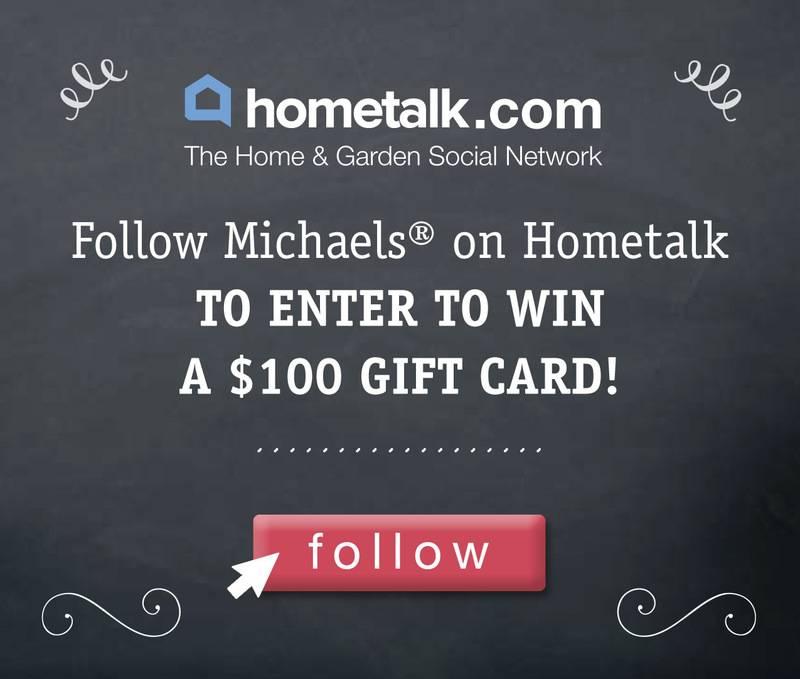 Thanks for all the fab ideas you share with us. I always love them! You did yourself proud Donna. 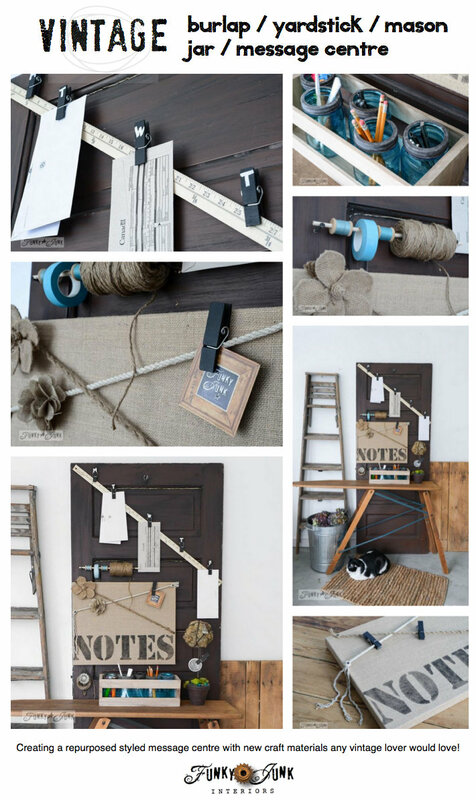 I really like this, especially the Burlap NOTES board. Cute Donna, I love this project! Your photos are all so pretty too! Love, Love, Love it. Great job! 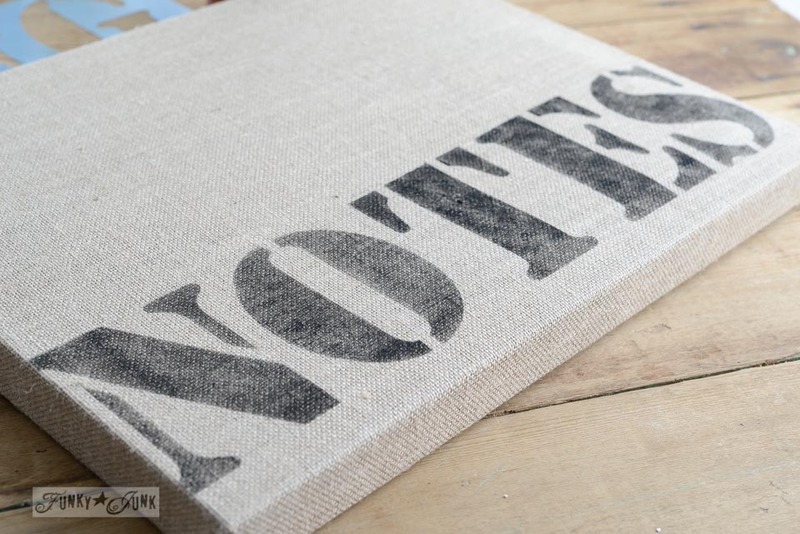 I love the burlap on stretcher boards. Oh, fantastic! I’m all over this one! Did you “antique” the jar lids or substitute old lids? Aloha! Now I see the link for the lids. Missed it at first!